IAM District 70 members in Wichita, KS raised more than $70,000 for Guide Dogs of America during the fifth annual Robert Martinez, Jr. Golf Tournament, the most successful GDA fundraiser to date for the District. 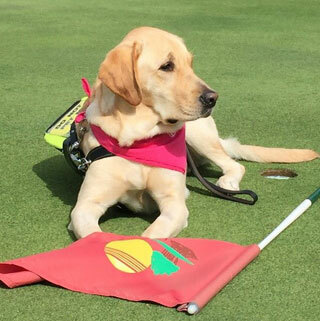 The tournament, which was held at Hidden Lakes Golf Course in Derby, KS, was kicked off by a rendition of “God Bless America” by Teresa Blevins, who had her guide dog Asia by her side. Seventeen teams took part in the tournament. District 70 does multiple fundraisers for Guide Dogs of America throughout the year. In June, more than 100 members showed up for “Bowling for Doggies,” raising approximately $8,000. Guide Dogs of America provides guide dogs and instructions in their use, free of charge, to blind and visually impaired men and women of the United States and Canada. It costs $42,000 to raise and train a puppy and place them with a partner.